Sedition has become so commonplace that charges against 14 Aligarh Muslim University students is given single column visibility on page 1—The Hindu doesn’t even do that. Express and HT identify the TV crew – it was from Republic TV. “It all started after some students objected to the proposed visit of All India Majlis-e-Ittehadul Muslimeen leader Asaduddin Owaisi to the campus,” clarifies TOI. A clash ensued, leading to the alleged assault on Bharatiya Janata Party (BJP) youth leader Mukesh Lodhi, who filed one FIR. 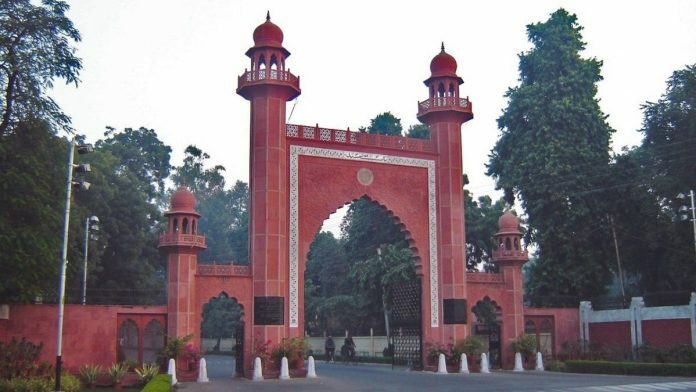 Another was filed by Republic TV “alleging that the AMU security officer and students “misbehaved” with her and her colleagues and snatched their camera,” adds the paper. Rafale makes it big again, thanks to the release of the highly anticipated report by the Comptroller and Auditor General. Most newspapers balanced the verdict: “Rafale deal cheaper by 2.86%, not 9% as govt claimed: CAG” (The Times of India). The Indian Express calls it a “shot in the arm for the BJP led government,” that has been under fire from Congress and Rahul Gandhi in particular. “The report was silent on offset partners,” the Express notes. “It was felt that poll pacts and a programme of governance would enhance the credibility of the combine given the scepticism that the coming together of different parties was only to contest polls against BJP,” said the report. The Hindu and Hindustan Times reduce the gathering to a photo-op on page one, leaving the details for their inside pages. The CAG report is centre stage on the editorial pages. TOI and HT arrive at a similar conclusion: “defense procurement is in a mess” (TOI) and “the process needs an overhaul” (HT). “It is a tragedy. A better procurement process needs to be worked out” (TOI). HT is “appalled” by the process — “JPC to oversee acquisition in defense needed,” says its headline. HT devotes its entire editorial space to CAG. It says the report is a “vindication” of the government but this is tempered by the French partner, Dassault having saved money in the new deal “and not passed it on to the government of India.” This will provide “enough material” for opposition attacks. It was an odd day of news: it saw the tabling of CAG’s Rafale report in Parliament, SP’s Mulayam Singh wish a second term for Modi, several Opposition meetings and late night pre-poll alliance talks. On Times Now, journalist Sanjeev Srivastava said Mulayam Singh was somewhat “senile” and everyone laughed while he spoke—nobody took his remarks `seriously’. Aaj Tak’s Anjana Om Kashyap, rightly, had a galaxy of panellists from Congress, SP, TMC and BJP to make sense of the day’s big political events. “Like the CBI, CAG is also an institution of the government, there is no validity (in this) report,” added TMC supporter Monojit Mondal. India Today discussed CAG’s Rafale report. To which BJP’s Aman Sinha replied that the Congress had “built a mechanism in which the dalals and middlemen used to thrive.” Here, the government negotiated directly with another government taking out “all the middlemen.” This was “paining the Congress,” he added. Rafale is to the BJP what Bofors was to Congress. @nramind is to Modi what he was to Rajiv Gandhi. This lives up to George Orwell definition of journalism: something that someone does not want printed. The rest, he said, was PR. Nobody knows the price of Rafale fighter planes yet we are told to believe that the NDA price is cheaper than the UPA's. Govt claimed it was 9% cheaper. CAG says it is 2.86% cheaper. Just shows how subjective the answer can be depending on who is giving it.